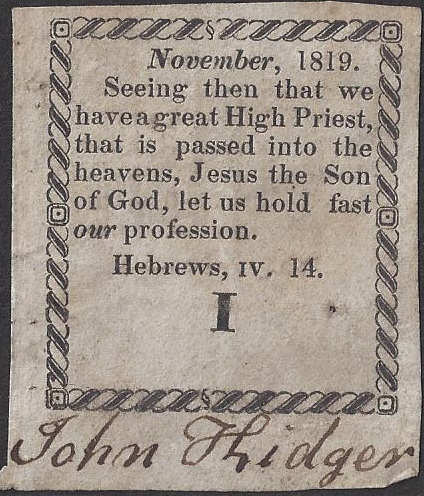 The ticket bore the text: ‘But we desire to hear of thee what thou thinkest: for as concerning this sect, we know that everywhere it is spoken against.’ (Acts 28.22), and the printed initials ‘H.B.’ for Hugh Bourne. These only appeared on the first ticket. It was dated May 1811, with the date letter ‘A’. A class ticket was a certificate of membership of the Methodist Church, and was first issued by John Wesley in 1742. 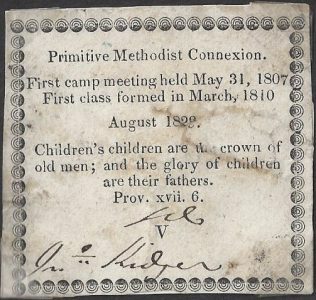 So it was a powerful symbol when Hugh Bourne decided to issue the first Primitive Methodist class tickets in May 1811. 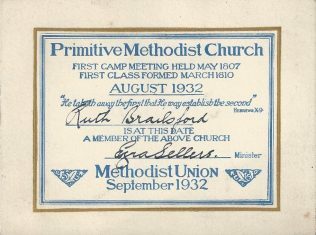 The ticket was received quarterly, dated, and inscribed with the name of the bearer. It admitted the bearer to the love feast, and was in fact their certificate of membership to the society. A ‘class’ was a small group, in which people met weekly to support each other in prayer and bible study. Each quarter, a minister would visit each class and give each member a ticket, with an appropriate verse of Scripture. 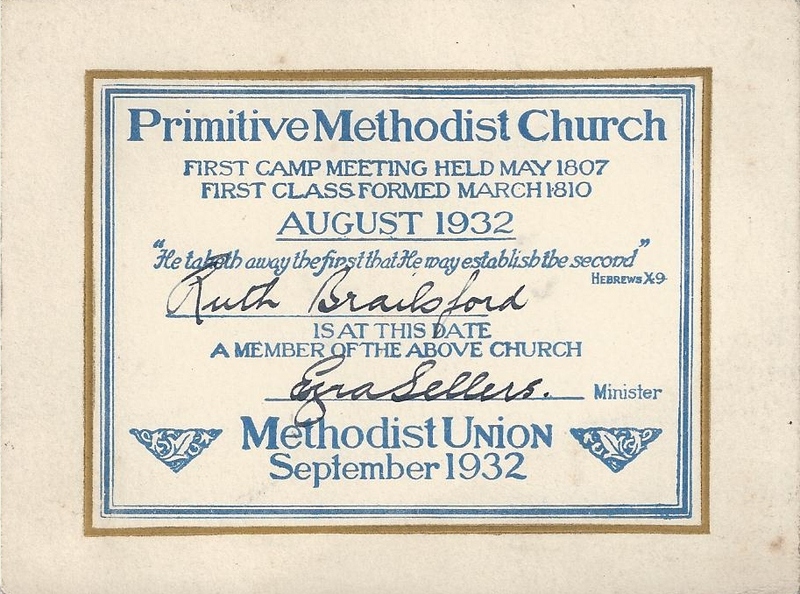 Members valued their class tickets, and kept them carefully, so you might find them among an ancestor’s cherished keepsakes. 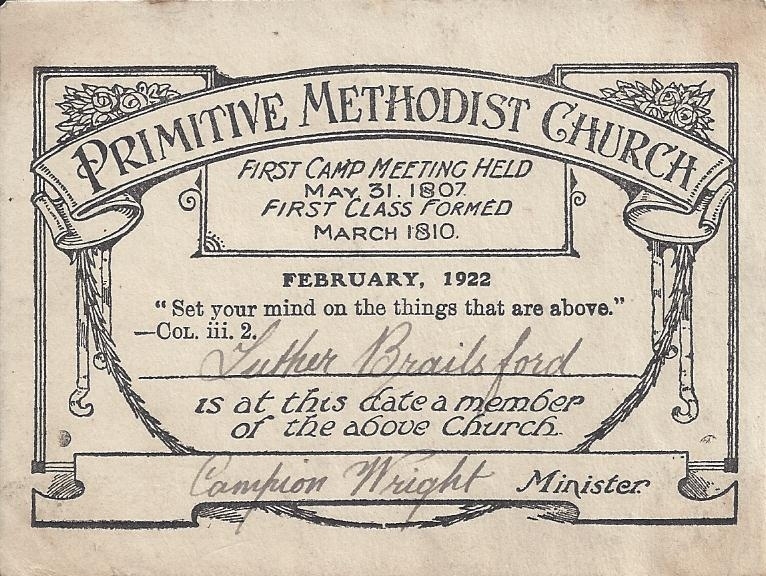 It was not until 1829 that the name ‘Primitive Methodist’ appeared on class tickets. The name was chosen in February 1812, so it did not even exist when the first class ticket was printed. In 1902, the word ‘Church’ was used for the firsty time, replacing ‘Connexion’. 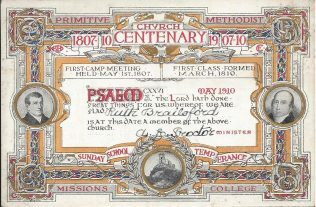 In May 1910 a special commemorative ticket was issued to celebrate the centenary of the movement. It was printed on stiff card, 5″ by 3″, in black, red, blue, grey, yellow and gold. 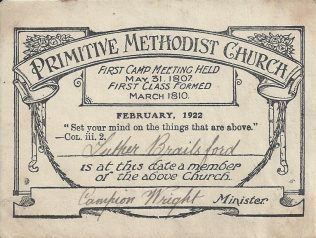 The lettering is so arranged that ‘Primitive Methodist’ precedes ‘Church’, ‘Sunday School’, ‘Temperance’,’Mission’ and ‘College’. The text is appropriately Psalm 126.3: ‘The Lord hath done great things for us, whereof we are glad.’ On either side are portraits of Bourne and Clowes, and at the bottom a vignette of Mow Cop. 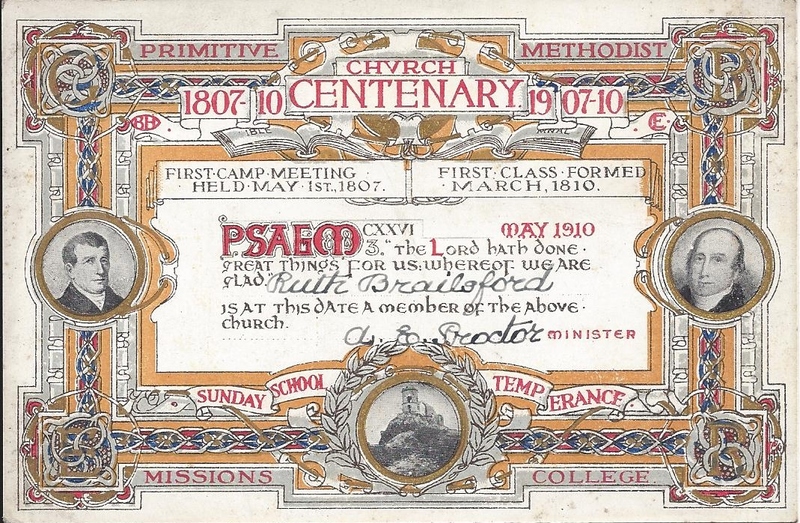 The corners bear the letters GR and ER, for May 1910 marked the death of Edward VII and the accession of George V.
This ticket belonged to Ruth Brailsford, of Blidworth, who was a member of the Reform Street society for over 74 years. 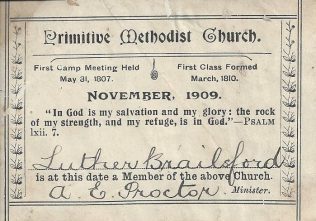 She was the daughter of John Kidger, a local preacher and class leader, whose name can be seen on the earliest class tickets here. 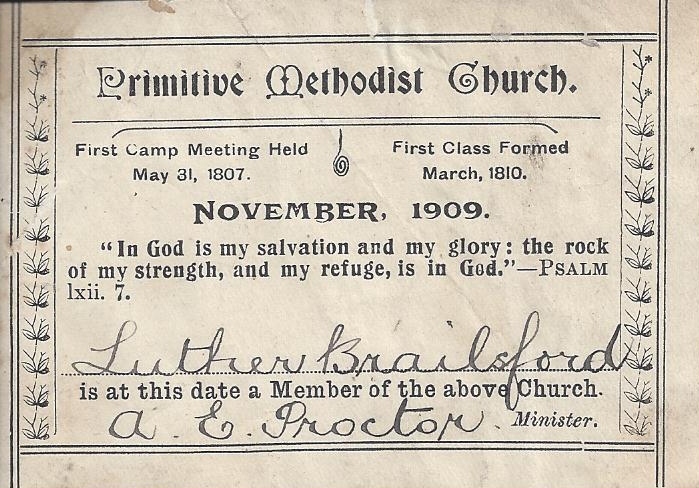 From 1922 to 1926 the wording of the texts was almost invariably from Moffatt’s translation of the Bible. 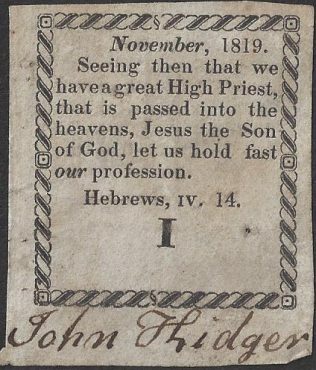 It is thought that this may have been the choice of Rev Edward McLellan, who was Connexional Editor during that period.